This anthology brings together over a dozen articles published by David Nimmer over the past decade regarding copyright, together with updated commentary weaving together the various threads running through them. The unifying theme running through the work is the need to reconcile standards in order to protect that most ethereal creation of mankind: the written word. From that unique vantage point the discussion delves into the religious roots and sacred character of the act of creation. Religion and copyright are brought into resonance as issues from one field are deployed to illuminate those in the other. 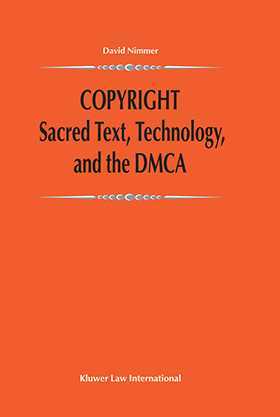 Given its culminating focus on the Digital Millennium Copyright Act this work of necessity drills deeply into current advances in technology, notably the dissemination of works over the internet. The religious perspective shines an unexpected light onto those issues as well. Preface. Acknowledgments. Table of Abbreviations. Part One: The Challenge of Technology. 1. Brains and Other Paraphernalia of the Digital Age. Part Two: International Roots. 2. Nation, Duration, Violation, Harmonization: An International Copyright Proposal for the United States. 3. Corcovado: Renewal¿s Second Coming or False Messiah? 4. The End of Copyright. Part Three: WIPO Treaty Triptych. 5. A Tale of Two Treaties. 6. Time and Space. 7. Aus der Neuen Welt. Part Four: Triumvirate of the Ancients. 8. Adams and Bits: Of Jewish Kings and Copyrights. 9. An Odyssey Through Copyright¿s Vicarious Defenses. 10. The Metamorphosis of Contract Into Expand. Part Five: The Digital Millennium Copyright Act. 11. Puzzles. 12. A Riff on Fair Use. 13. Kisses Sweeter Than Wine. 14. Back from the Future: A Proleptic Review. CODA: ¿Thou Shalt not Steal¿: A Canon of Construction of Title 17?